Forget everything you know about traditional advertising. There's an emerging channel where, like video games, user interactivity plays a central role in the experience. It's called interactive advertising and I recently had a chance to speak with a company at the forefront of the industry, Monster Media. Founded in 2004, Monster Media is a full service multimedia company focused on brand interaction through the use of portfolio of products that engage audiences in ways traditional TV, print or display advertising simply can't do. The key difference is Monster Media's ability to capture the attention and imagination of people through advertising that must be experienced, instead of simply watched or read. Like Microsoft's upcoming Kinect for Xbox 360, much of what Monster Media creates uses player movements and gestures to "control" the interactive advertisement. During a demo by Crystal Koskinen, Director of Sales Canada, I was shown a campaign the company launched last year for ESPN to raise awareness for Monday Night Football's 40th season kickoff. 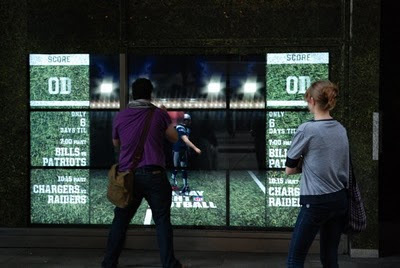 The massive digital football game (see image above) utilized an interactive LCD wall combined with gesture-based technology that challenged players to catch as many footballs as possible, using body movements, and high scores were submitted in real-time to see how they measured up against players in other cities. To begin the game, pedestrians were required to touch a start button and were brought to quarterback selection screen where they could select the quarterback of their choice from a popular Monday Night matchup. 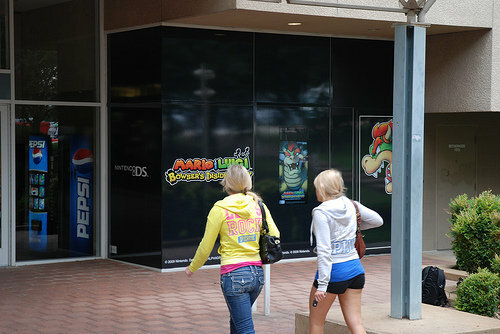 A video of this unique interactive advertisement can be viewed here. Noticing a huge potential market in Canada, the company opened their first office here in March 2010. The first campaign recently kicked off in Toronto for BMO Financial Group outside their corporate headquarters at King and Bay Streets. Hot off the heels of the World Cup, the interactive display is to celebrate the growing excitement around grassroots soccer in Canada. Similar to the EPSN game, eight linked LCD screens utilize a combination of touch activation and motion cameras to transform pedestrians into virtual athletes, only in this case they play the role of a goalkeeper who goes one-on-one with a selection of Canada's future soccer stars. The campaign, including the eight-by-six metre display and interactive custom LCD wall, is the first-of-its-kind in Canada, says Sandy Bourne, Vice-President, Advertising, Sponsorship, Events and Merchandising, BMO Financial Group. In addition to touch interaction and gestural interaction, Monster Media displays are capable of incorporating many other technologies including augmented reality, which Sony (e.g. EyePet, Invizimals) and Microsoft (e.g. In The Movies, Kinect) are also getting into in a big way, and mobile interaction by dialing an 800 number or sending an SMS text to instantly turn a cell phone into a keypad to control the ad. The company is also no strange to working with game publishers, having worked with Nintendo to promote last year's Mario and Luigi: Bowser's Inside Story and with 2K for NBA 2K10. Last year the company created 245 campaigns, such as a giant pinball machine in Times Square for Zyrtec, and an NHL Showdown competition for Verizon that cast pedestrians in the role of goaltender against some of the NHL's most coveted hockey players. Monster Media has "big plans" for Canada says Koskinen, and says the BMO Financial Group campaign will be the first of many interactive advertising campaign the company will bring to Canadian consumers.